Estonia always had its own music style in the Eurovision Song Contest. Despite from the debut in 1994 the Estonian entries were highly voted for, and one victory in 2001 with “Everbody” sung by Tanel Padar & Dave Benton put the crown on all efforts. The Estonians do have more in common with the Scandinavian culture and lifestyle than with the Slavic-Russian. That’s probably also one reason that the Eastern European countries – beside of the Baltic countries – are not likely to vote for Estonia contrary to Sweden, Norway, Denmark, Iceland and Finland. Last year’s entry “Rändajad” was a superb and outstanding song which brought a respectable 6th rank in the final. Estonia did not profit from the qualification shows so far, last year it was the first time Estonia qualified for the final at all. This year there will be another very original and unusual song for Estonia called “Siren” sung by Malcolm Lincoln. Malcolm is a striking young guy with a special stage presence and choreography. “Siren” is not a typical Eurovision song; it’s contemporary with an unsteady rhythm and a catchy chorus even though. 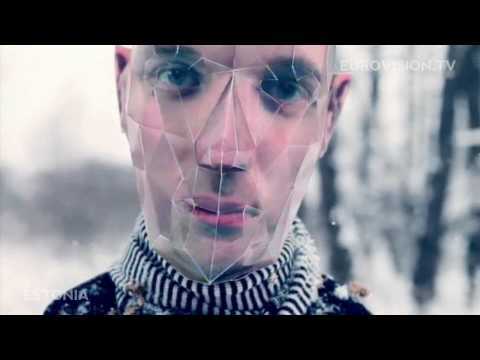 In the video clip you can watch a guy with a too big head walking through a snowy landscape – extraordinary in all ways. This song will have its fans for sure. Spunky!